Biotechnology holds no secrets for us! The 3rd edition of ADAMED SmartUP Academy workshops dealt with the subject of antibodies – an indispensable tool in the work of physicians and scientists. Course participants had an opportunity to perform the role of clinical laboratory technicians and run a number of diagnostic tests. The course took place on 11 March this year and was organised in cooperation with the Centre for Innovative Bioscience Education. During the course young people had a chance to fill in the gaps in their knowledge of antibodies which, due to their intrinsic ability to bind together with an antigen, are broadly applied in medical diagnostics and are the main constituent of many tests. In order to improve the understanding of mechanisms concerning such tests and their suitability in a given case, the lecturers gave speeches on the structure, properties and different ways of obtaining antibodies. The participants were particularly enthusiastic about the practical classes in a laboratory. They ran two diagnostic tests with their own hands: an enzyme-linked immunosorbent assay ELISA and an anti-streptolysin O test. The first one is used, among other things, to detect antibodies in blood serum (e.g. HIV test) and to measure the level of antigens in the tested sample. The second test is used to confirm the history of streptococcal infection and to diagnose rheumatic disorders. It was only the third workshop of ADAMED SmartUP Academy during this year’s edition. So, if you want to be a part of such adventure, there is still a window of opportunity! 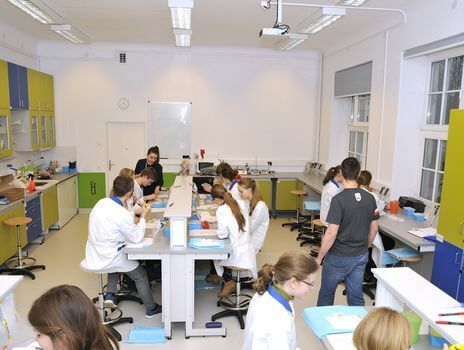 Classes in medicine, chemistry, biochemistry and physics in Warsaw, Łódź, Gdańsk, Gliwice and Lublin still lie ahead! The application form is available at: https://adamedsmartup.pl/academy.